Pirate Waistcoats and Vests are great for adventures on the high seas! The long period cut and buttons make these waistcoats stunning pieces of pirate garb. 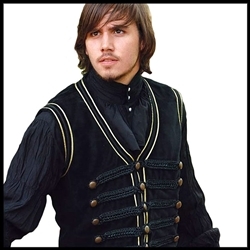 Cooler in hot weather, the long vests are perfect by themselves or can be worn with any of our Pirate Coats. Our Pirate Captain Waistcoat is cooler than wearing a captains coat and is easier to swordfight in! Made to be worn under a Frock Coat if you so desire! Our Plus Size Pirate Captain Waistcoat is cooler than wearing a captains coat and is easier to swordfight in! Made to be worn under a Frock Coat if you so desire! The Navy Velvet Pirate Vest falls to mid-thigh. With a cotton velvet outer and satin lining, this vest feels as good as it looks. Functional metal buttons down the front of the vest add versatility- buttoned all the way up for a polished pirate, or leave a few undone for a suave swashbuckler look. The Navy Velvet Pirate Vest - Plus Size falls to mid-thigh. With a cotton velvet outer and satin lining, this vest feels as good as it looks. Functional metal buttons down the front of the vest add versatility- buttoned all the way up for a polished pirate, or leave a few undone for a suave swashbuckler look. This Navy Velvet Pirate's Coat is made from 100% cotton velvet. It is lined with quality satin for warmth and comfort. Functional pockets at both sides. Stylish, non functional metal buttons adorn the coat from collar down the front, on both sides. Shown with the matching vest, sold separately. This Navy Velvet Pirate's Coat - Plus Size is made from 100% cotton velvet. It is lined with quality satin for warmth and comfort. Functional pockets at both sides. Stylish, non functional metal buttons adorn the coat from collar down the front, on both sides. Made from 100% cotton velvet, this Hunter Green Pirate's Vest features a satin lining and metal buttons all the way down the front. Any pirate would look amazing in this comfortable, flowing vest. Made from 100% cotton velvet, this Hunter Green Pirate's Vest - Plus Size features a satin lining and metal buttons all the way down the front. Any pirate would look amazing in this comfortable flowing vest. Made from 100% cotton velvet, this Hunter Green Pirate's Coat features a satin lining that is smooth to touch. To add elements of pirate fashion, there are decorative metal buttons down each side, above the functional pockets, and also at the cuffs. Shown with matching vest, sold separately. Made from 100% cotton velvet, this Hunter Green Pirate's Coat - Plus Size features a satin lining that is smooth to touch. To add elements of pirate fashion, there are decorative metal buttons down each side, above the functional pockets, and also at the cuffs. Shown with matching vest, sold separately. Made from 100% cotton velvet with a satin lining, this Green Velvet Pirate Coat is soft both inside and outside. It has large bell cuffs and functional metal buttons. It also has functional pockets at each side.